There is no arguing that Rome, Italy is one of the world's greatest and most beautiful cities in the world, having attracted millions of people from every corner of the globe. With an ancient history, outstanding cuisine, and so much culture to soak up, it's no wonder that the city requires quite some time to explore. A great way to add a break between the hustle and bustle of Rome is to take a day trip to add some variety and sightseeing options to your Italian getaway. Here are some of the best day-trip options from Rome. 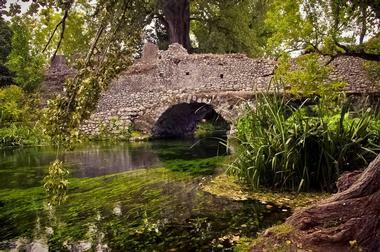 A breathtaking example of Italian poetry and medieval architecture, the Giardino di Ninfa is a landscape garden in the Cisterna di Latina of central Italy. The park is situated across 105-hectares of land and has become known as a true literary salon, having inspired the work of writers like Truman Capote, Moravia, Virginia Woolf, and Ungaretti. 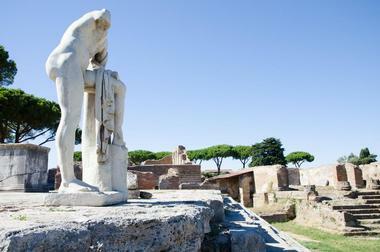 If there's one thing that Italy has no shortage of, it's ancient Roman ruins. While there are many to see in the center of Rome, Ostia Antica is home to an incredible excavation site that was once the most important port city of the Roman Empire. The city dates back all the way to 7th century B.C. although some of the items uncovered at the site can be dated back all the way to the 3rd century B.C. A collection of charming wine-producing hill-towns to the south east of Rome, Castelli Romani is home to several beautiful towns, and each has its own claims to fame. Great villas and palaces can be found all over the villages, as the area was once a favorite retreat for wealthy Roman residents in the past. If you're visiting Rome in the summer, a great way to beat the heat and cool off is to take a quick day-trip to the nearby beaches of Santa Marinella. The inviting crystal clear waters of the Mediterranean are easily worth the 50-minute train ride from Rome, and the private and public beaches beckon heat-stricken travelers from near and far. Once an important Etruscan City known as Caere, Cerveteri is a UNESCO World Heritage Site and a major cultural center of the Etruria civilization, which pre-dates the Roman Empire. Travelers can visit several Etruscan necropolises in the city, which are huge monumental tombs that are partly cut into the tufa rock. Eerie and evocative, the necropolises imitate houses and are a testament to the wealth and lifestyle enjoyed by those entombed there. Just a short 55-minute trip from Rome, the historic hill town of Tivoli is home to not one but two UNESCO World Heritage Sites. 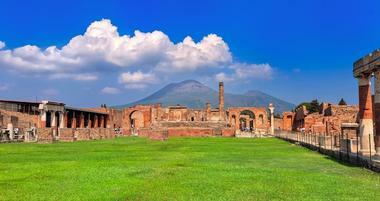 Hadrian's Villa is the first of the sites to see and dates back to the 2nd Century C.E. Built by Emperor Hardian as a country retreat, the villa is actually composed of over 30 incredible structures, some of which have yet to be excavated. By regular standards, the villa could be considered a town on its own, with lakes, libraries, temples, and gardens located within the area. The Renaissance Villa d'Este is the second UNESCO site to see in Tivoli. Built in the mid-16th century for Cardina Ippolitol d'Este, this villa was built over a Benedictine convent and features an enormous garden with multiple fountains, grottoes, and sculptures. Not to be missed are the massive Fountain of the Dragons, the Hundred Fountains, and the Water Organ Fountain. 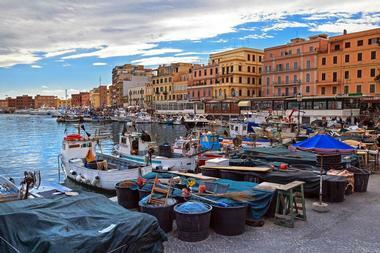 A medium-sized fishing port on the coast of Lazio, Anzio was once an important Roman port that is now most famous for its military significance in the Second World War. Although Anzio took a beating during World War II after serving as a landing spot for Allied forces in 1944, the town was able to rebuild and retain its ancient fishing town atmosphere. The port remains quite busy to this day and offers an idyllic view of sand dunes and the magnificent buildings of Nettuno. There are large Liberty-style villas to explore near the shore while dozens of restaurants serve up delectable seafood dishes at the port. History lovers can make their way to various look-out points to view ruins of the old Anzio port along the rocks below. 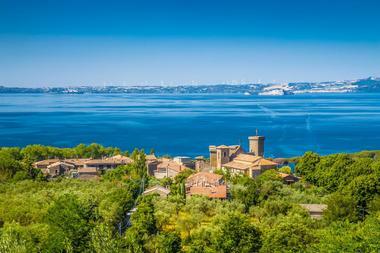 Although Lake Martignano is much smaller than its neighbor Lake Bracciano, it enjoys the peace and tranquility that Lake Bracciano doesn't always have. The calm waters of the lake offer a fantastic respite on a hot day, and the best part is that it's only a one-hour drive away from Rome. Meanwhile, visitors who want to spend more than a day at the lake are welcome to camp overnight. Once at Lake Martignano, make sure to pay a visit to Agriturismo il Castoro where visitors are welcome to enjoy the grass beach and dozens of hammocks for just a small fee. There is also a simple and affordable restaurant in the area that dishes up spectacular grilled meat dishes alongside ice-cold beers. 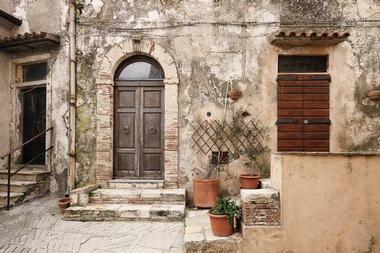 One of the rarest things you'll ever find in Italy is not a castle or Roman ruins. In fact, you'll find quite a lot of those. No, the rarest thing you'll ever find in Italy is a free beach, and that's exactly what vacationers can look forward to on a day-trip to Santa Sevara. In addition to long stretches of beach and spectacularly blue waters, Santa Sevara also has a medieval castle and Roman ruins ripe for exploration. Take a walk around the walled village by the beach and examine the Roman-era foundations that are made of huge cyclopean masonry. The castle in the area dates back to the 11th century and also features a Norman tower. After seeing all the ruins have to offer, hit the beach and spend the day lapping up the sun, surf, and sand. 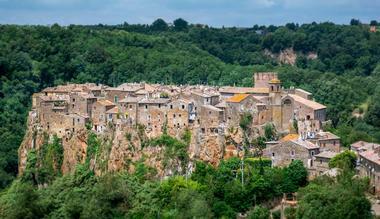 Perched on top of a rocky outcrop is the beautiful and breathtaking village of Calcata. With fantastic views of a wooded valley and just thirty miles from the great city of Rome, Calcata makes an ideal day-trip for those looking for a destination off the beaten path. After Calcata was abandoned in the 1930s, artists and creatives from Italy and around the globe flocked to the hill town and made it their home. They successfully brought the ancient village back to life, restoring ruins and giving it a bohemian atmosphere it didn't have before. The town can be easily explored in a day with incredible views, wonderful architecture, and welcoming locals that make the trip memorable. The Lago di Vico is an unspoiled and delightful gem in Lazio and a reservoir that provides a respite from the summer heat in Rome. With fresh, clear, and calm waters, the lake is the perfect place to go paddle boarding, kayaking, and canoeing, thus making it a top day-trip destination for adventurous travelers. In addition to a wealth of water activities, Lago di Vico has tons of wildlife to venture into with an extensive beech forest and a variety of bird species to watch. 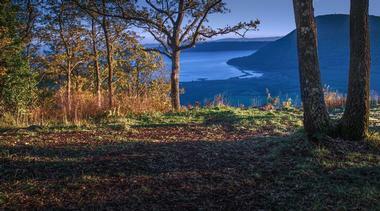 Fabulous scenic trails are also available for those who want to go on a leisurely walk or trek. There are picnic tables along the lake for visitors who want to take it easy. 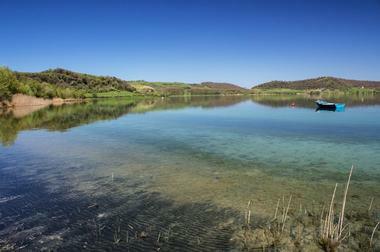 Just a stone's throw from Rome, the Sabina Region is an underappreciated destination in Rome's peaceful countryside. The region's landscape features picturesque olive groves, ancient hilltop villages, thriving vineyards, and villages filled to the brim with medieval architecture and tradition. Go on a trek across the panoramic mountains of the region or spend a day lounging by clear streams to soak up the natural beauty of the countryside. For a culinary exploration of the region, visit an olive grove or take a trip to one of the top vineyards in the area. No matter what you decide to do in the region, a memorable visit awaits. Easily accessible from the ancient city of Rome, Bomarzo is a fantastic day-trip destination for those who want to explore cultural gems like the Park of Monsters. Built in 1552 by Pirro Ligorio, the architect who completed the Cathedral of Saint Peter after Michelangelo's death, the Park of Monsters was relatively unknown until Giovanni Bettini restored it in 1954. Today, the park is home to sculptures and structures that pay homage to Roman mythology and fantasy. There are over twenty-four works of art in the park, including sculptures like the Pegasus, the Turtle, Neptune, Ceres, and the Temple. Each piece is said to come together to tell a story. 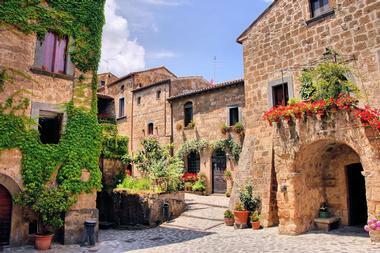 Located in the province of Viterbo within the Lazio Region, the old Etruscan town of Tuscania is saturated with culture and history. 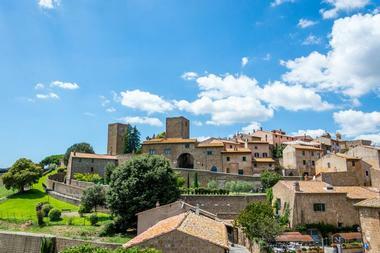 Perfect for a quick day-trip from Rome, Tuscania is just an hour and a half way from Italy's capital and is home to several beautiful sites. The Church of San Pietro is the main monument in the city and was built in the 8th century. Other sights to behold in Tuscania include the Etruscan Museum where sarcophagi from nearby tombs have restored and put on display. The Church of Santa Maria Maggiore is equally interesting with its finely decorated portals and magnificent façade. Also not to be missed are the Tower of Lavello, Fontanna delle Sette Cannelle and necropolises like the Tomb of the Queen and the Pian di Mola. Known as the Jewel of Italy, Sermoneta is one of the most well preserved Medieval villages in Italy and was even cited by Virgil in The Aeneid. 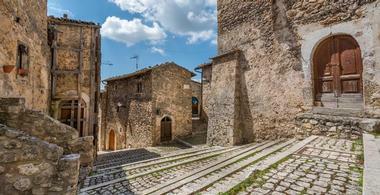 Situated in the province of Latina, Sermoneta is a quick trip from Rome and sits 843 feet above sea level. Despite how old the city is, it only began to flourish near the end of the 1200s when the Caetani Family became the governing authority. Some of the top sights in the city include the Castello Caetani, an imposing castle with incredible views of the Pontine Plain. Sermoneta includes many other well preserved sites, along with an artistic and cultural heritage that is striking at the very least. It has served as the set for over eighty-six Italian and international movies, and tourists traveling to this city can be assured of its beauty. With long sandy beaches, breathtaking natural vistas, and a rich history, Capalbio is a gorgeous village in southern Maremma that is easily travelled to from Rome. The charming town is great for a visit at any time of the year but truly shines in the summer season. 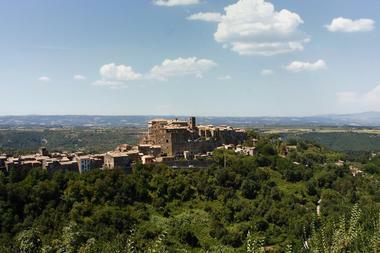 One of the top places to visit in the village is the Fortress of Aldobrandeschi and its ancient crenelated walls. Other must-visit sites include the Church of San Nicola, which is situated in the main square and was built sometime between the 12th and 13th century. The Oratory of the Providence has also captivated many visitors with its beautiful 16th century frescoes, while the coast of Capalbio provides the ultimate Italian beach getaway with over 12 kilometers of sandy beaches. 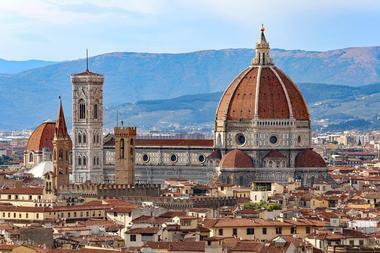 If Florence isn't already on your itinerary, now is the time to add it. Florence is home to some of the most impressive highlights of the Renaissance capital, and the best part is that it's only a quick train trip from Rome. Make plans to see outstanding museums such as the Uffizi Gallery, the Bargello, and the Accademia or head directly to architectural masterpieces like the Santa Maria Novella or the Santa Croce. Travelers can't visit Florence and not see the library of San Lorenzo. The library offers a breathtaking exhibition of Michelangelo's pure architectural genius and is bound to astound all those who see it. When you've seen all of the museums and monuments that your heart desires, head outdoors to explore the Boboli Gardens or to trek up a hill to the San Miniato al Monte church. Sitting on a grand stone throne a thousand feet above the valley floor, the town of Orvieto in the Umba region is an absolutely stunning daytrip destination. Orvieto is arguably the most striking and memorable of all of Italy's hill towns and features a 13th century cathedral and former papal residences as well as an extensive and intricate network of underground tunnels. The town is separated into two distinct sections: the old-town on the hilltop and the relatively modern part of town below. 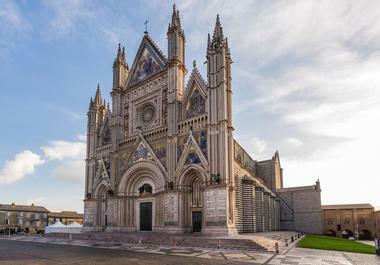 While there are some points of interest in the new part of town, your time is best spent at the top of the hill where the lively Orvieto cathedral beckons. Don't miss out on seeing the Chapel of San Brizio within the cathedral grounds as it features frescoes of by the brilliant Luca Signorelli. Although the historic Civita di Bagnoregio was largely abandoned in the 17th century after suffering through earthquakes and structural erosion, the impressiveness and beauty of this hilltop town is really quite hard to beat. The population of Civita di Bagnoregio is now concentrated in a newer town simply referred to as Bagnoregio, but the historic center still stands and has drawn many visitors over the years. Quiet and charming, the town features little lanes, quaint potted geraniums and tiled roofs, all of which contribute to an otherworldly atmosphere. One of the main highlights of the town is the massive stone passageway that was cut by Etruscans over 2,500 years ago and decorated with a Romanesque arch in the 12th century. 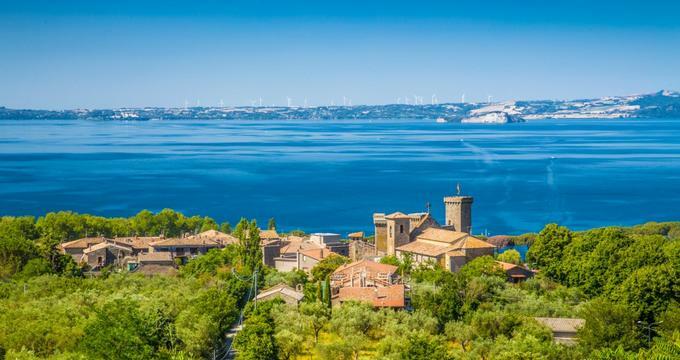 Arguably the perfect example of environmentally sensitive tourism in Italy, Lago di Bolsena is surrounded by archetypal villages and located at the foothills of Tuscany. The untouched and unspoiled lake is far off the beaten track and inspires a spirit of discovery in all those who make the trip to its shores. Several hiking trails around the lake provide a great view of the idyllic villages and towns in the area and paths through a charming cypress forest. Thanks to the unique location of the lake, there is a range of other activities to enjoy in addition to its cultural highlights. Surfing and sailing are very enjoyable options while the hilly area around the lake is ideal for travelers with a love for mountain biking. 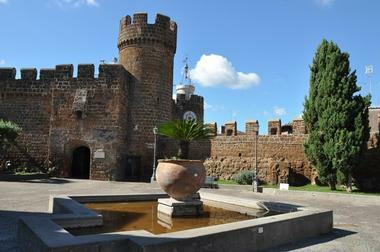 Famous pilgrimage routes like the Via Francigena and Via Casia are also highlights in the area. Santo Stefano di Sessanio is an amazing 16th century village that sits 1,250 meters above level in the Gran Sasso National Park. This remarkable village is easily accessible and offers incredible architectural structures from its many archways, cobbled streets, and the fantastic Medici Square. Santo Stefano also has a rich history having served as a strategic part of the commercial route between Rome and the Adriatic coast. As such, the area features some striking historical sites including a marvelous watchtower that offers an unbeatable view of the surrounding area. 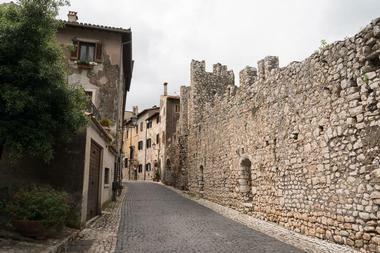 With so much history and culture etched into the alleyways of the village, there's no doubt that a trip to Santo Stefano di Sessanio will one for the books. A striking seaside town to the south of Rome, Sperlonga features whitewashed houses, steep headland, and an unbeatable old town charm. 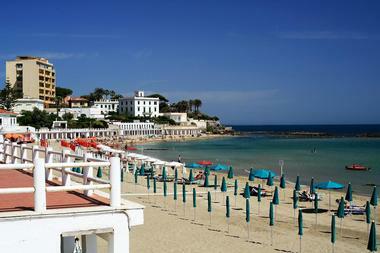 The main draw of Sperlonga is its many exquisite beaches with their clean sand and clear waters. Luxurious and peaceful, the beaches are split between establishment owned areas with sunbeds and free beaches where anyone is free to go and enjoy the area. 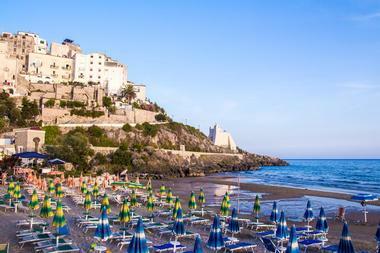 Apart from the beautiful beaches, Sperlonga also offers some historical sites such as extensive ruins found inside a cave and a huge sculpture that once dominated artificial fishponds. Sperlonga is also home to the Museo Archeological Nazionale and the Grotto fo Tiberius. 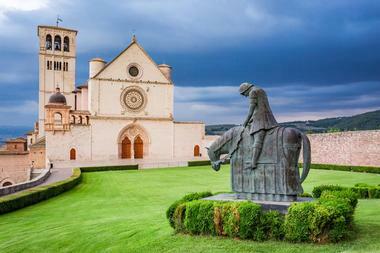 A small Umbrian town in central Italy, Assisi is a short drive away from Rome and just 12 miles east of Perugia. It is best known for being the birthplace of Italy's patron saint, St. Francis of Assisi, who is also one of the most popular Catholic saints in history. The main attraction of the town is the 13th-century Basilica di San Francesco, which houses sacred relics of St. Francis along with gorgeous frescoes depicting his life. There are many other churches in the town worth visiting for their architectural beauty, history, and connection to St. Francis. Sacred shrines have made this town a major destination for Catholic pilgrimages while Roman ruins and beautifully preserved medieval streets make the town a popular tourist destination. Step into a time machine and take a trip back into the past to the ancient city of Pompeii, a Roman town frozen in time at 79 AD due to the devastating eruption of Mount Vesuvius. Explore majestic and opulent homes as well as modest ones that have been expertly restored and preserved or visit Roman shops that were once frequented by Pompeii's citizens. In other parts of Pompeii, baths and brothels stand ready for exploration, while the Villa of Mysteries offers a bizarre experience with frescoes that have confused scholars for many years. Join in on the debate and try to interpret the preserved frescoes or walk through the ancient streets of the city to spot graffiti that can still be seen to this day on some of the city's walls. Home to thirteen beautiful towns spread across a strip of sun-kissed land, the Amalfi Coast is a UNESCO World Heritage Site that absolutely shouldn't be missed. The coast is characterized with a breathtaking labyrinth of stairways and narrow alleys that connect the mountains and the sea. Pebbled beaches are scattered between bays and fjords from which the ancient towers can still be seen. 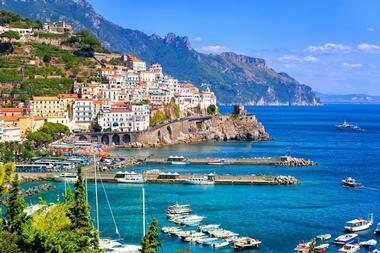 Each town along the Amalfi Coast is connected by one long scenic road that was built during the Bourbon period and is largely considered to be Italy's most beautiful road. The coast is a majestic wonderland for trekking enthusiasts and a breathtaking day-trip for any type of visitor to reach its shores. It is, in short, nothing less than spectacular.